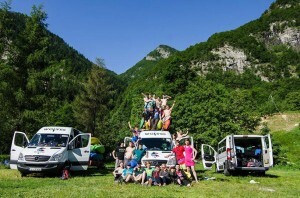 UL Kayak Club’s annual Alps trip was one for the books this year. After piling all the gear into UL vehicles, the first wave of paddlers began the journey with a pleasant ferry bop on over to France. Upon arrival, they took off to make the road trip to their home for the week: the Campertogno campground in Italy. Having set a higher standard this year for the first of the three week trip, the club was able to focus on truly pushing their limits like never before. The group greatly challenged themselves on various runs of the Sesia, Egua and Sermenza rivers. Along with honing in on personal paddling skills, they all further developed their river-leading skills in preparation for the second wave of the club’s arrival. After a more than satisfying week in Italy, the group continued on to the Milan Malpensa airport to unite with fellow members of the club. As a number of nationalities were represented on the trip, it seemed like ages before everyone was let through customs at the airport and allowed to join in on the fun. Here, the ULKC trip doubled in size to around thirty lads and a mighty rubber-duck mascot, named Chestnut. Getting on the road a tad-bit behind schedule for Slovenia, we arrived to camp around 4 am — just in time to set up camp in the dark before the sun began to rise. The next day began another adventure with the club and it’s range of paddling abilities. Over the course of the next week, longer than expected due to exceptional river levels, everyone focused on different goals on various runs of Slovenia’s Soca river. While one individual may have been working simply on getting their roll down, others really began to put their dynamic leadership and teaching practices into place. River leaders and beginners alike learned from each other and pushed each other to new levels of improvement. Beginners asked questions to develop paddling techniques and leaders asked for feedback from the river that day to gain insight on what methods had the most impact. Mixing up the river groups everyday, everyone had the chance to work together towards a common goal of bettering the club (with loads of craic along the way!) It was fantastic to see people overcome obstacles and new challenges everyday. Important skills covered on the river included basic river signals, rescue skills, river reading, and paddling techniques. While in Slovenia, members of all ability had the opportunity to participate in a competition right on the river of the campground. Those not competing enthusiastically cheered on our participants to some great finishes for the club. As well as improvement on the river, much was to be said for the kitchen. Along with paddling, the bar was raised for the cooking as well this year; chefs we didn’t even know were in the club prepared gourmet meals. Fire-baked potatoes were a delicacy one evening that reminded us of home. Even the standard baguette, ham, cheese, pesto and more baguette sandwich lunches seemed to transform overnight. Lettuce, tomatoes, and other veggies soon became a thing. It was crazy. Crazy good. A week quickly flew by before we said goodbye to the beautiful green rivers of Slovenia and packed up the vans with those we only brought along for their Tetris-like packing skills. Back to Italy we all went for two more full days of the river. As per the norm, we set up camp in the dark, and got some shuteye. The next two days challenged the beginners to new frontiers. Beyond some good wave trains, beginners had the option the first day to run Sorba Slides. This was the first experience for members who only began kayaking this year to really test their limits. A big testament to the great experience that everyone had on the trip thus far, was that everyone out on the river that day ran the slides. It was a thrilling experience to say the least. And the next day, a nifty rig was engineered to allow for a maximum amount of runs of the Top Drop on the Egua. In the morning, the group parted ways. After saying goodbye to those who so foolishly took the easy way out and flew back to Ireland instead of road tripping, some brave souls stuck around and reaped the benefits of a surprise trip to Disneyland in Paris. There, we relaxed from the long and tiring trip by running around, pushing little kids out of the way and catching as many rides as we possibly could. All in all, the ULKC Alps trip of 2K14 opened everyone’s eyes to what this club is really capable of doing and how fortunate we are to be involved in it. The Alps trip allowed us all to push our own envelopes, in one of the best environments we could imagine. The ULKC.